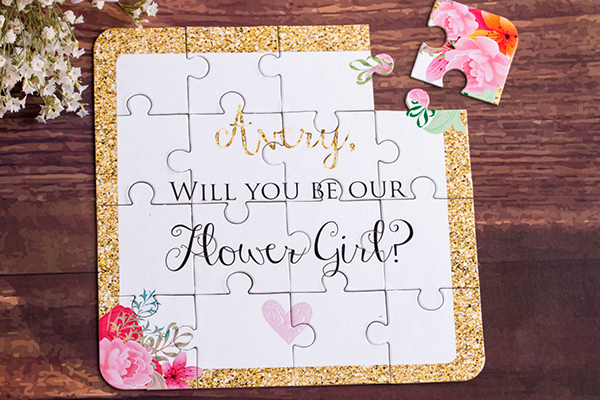 Your flower girl will love putting together this puzzle to uncover the secret message. Make your ring bearer feel extra important by giving him a badge and treating it as a secret mission. Pop the question to your flower girl with a ring pop! Sweeten the deal with milk and cookies. What could be more fun than asking with a confetti popper? A scratch-off balloon is a fun choice for an older child attendant. Can't choose just one or two flower girls? You don't have to! This teacher asked her students to fill the role. Man's best friend makes a perfect ring bearer. Have him dress the part in an adorable doggie tux that matches the groom and groomsmen. There's no age limit on being a flower girl! These grandmas are loving the role. Give your flower girl the all-important task of helping you into your wedding dress. Capture your ring bearer's reaction when he first sees you in your gown. Switch roles and give your flower girl a truly "bridal" moment she'll love. You can't go wrong with oversized tutus. Top it off with a hat for a truly dapper look. Complete your flower girl's look with a veil. Keep it casual (and comfy) by letting the boys wear shorts. Simply adding a bowtie and suspenders makes them wedding-ready. Personalize your flower girl's dress and turn it into a one-of-a-kind keepsake by adding her monogram. Let your ring bearer show off his silly side with an undercover superhero costume. A moss-covered basket is the perfect match for an outdoor wedding. Make your guests laugh with a fun sign. Let your ring bearers express how they really feel about your wedding ceremony. This ring bearer's sweet sign also works beautifully as a photo prop. If you already have children together, this sweet sign is the perfect fit. If you have multiple ring bearers, give each a one-word sign to spell out a phrase as they walk down the aisle. Choose a flower girl basket that reflects your wedding season, like this sweet pumpkin. Keep the rings secure with a lock box. Your ring pillow doesn't have to be a pillow at all! Reflect your favorite shared hobbies or activities instead. Strength in numbers — if your flower girls are on the younger side, send them all down the aisle together to prevent meltdowns. Your ring bearers will feel undoubtedly cool driving down the aisle in a Cadillac. Coax shy flower girls down the aisle with the promise of a sweet reward. Your wedding is no match for nap time! If your ring bearer is young, make sure you have a backup plan. Push a young flower girl down the aisle in a flower-covered carriage. A simple eskimo kiss from the ring bearer makes for a memorable photo. We love the adoring gaze the flower girl is giving the groom. Kids, cover your eyes from the PDA! These giggling flower girls are just too cute. Capture a photo of your flower girl dreaming of being the bride, and save it to give to her on her own wedding day. They may be dressed to the nines, but they're still kids! Capture their silly sides in a photo. The sweetest frame — let your flower girl and ring bearer help set up a picture-perfect moment. Your ring bearer will feel like such a stud surrounded by all the bridesmaids. Share a special moment under your veil with your flower girl. Let your flower girl play dress-up in your wedding gown. This suave ring bearer is too cool for school. Most couples have their child attendants sit during the ceremony so they don't get antsy — but then you'll miss moments like this! This flower girl jumped for joy as the couple shared their first kiss. Invite the flower girl and ring bearer to share the floor during your first dance. Your single bridesmaids may not be enthused to catch the bouquet, but your flower girl will love it. Sippy cups are the perfect gift for toddler attendants. Give your flower girl a meaningful keepsake to hold dear until her own wedding day. Not only are these crayons adorable, but they'll keep your pint-sized attendants occupied during the reception.